Trump and the GOP are openly attacking the legitimacy of black voting. 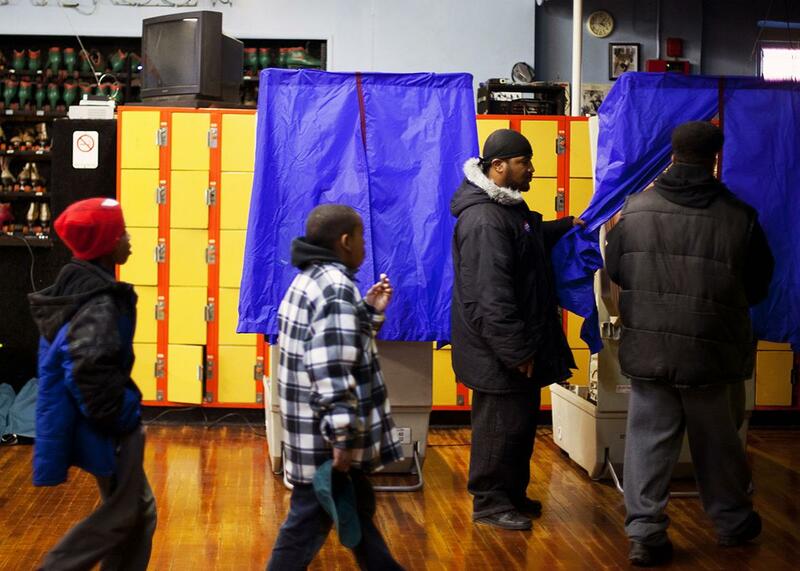 Residents cast their ballots at a polling place inside the Elmwood Roller Skating Rink on Nov. 6, 2012, in Southwest Philadelphia, Pennsylvania. Donald Trump doesn’t know how to lose. In 2013, when his show The Apprentice got stiffed by the Emmys, Trump said the process was unfair and political. In 2012, after Mitt Romney lost the race for president, Trump denounced the results as a fix for Barack Obama. He tweeted: “The phoney electoral college made a laughing stock out of our nation. The loser one! We can’t let this happen. We should march on Washington and stop this travesty. Our nation is totally divided!” After Trump lost delegates to Ted Cruz at state conventions in Colorado, Indiana, Iowa, Louisiana, Michigan, North Dakota, and South Carolina, he denounced the process as “rigged.” And now that he’s losing to Hillary Clinton in the 2016 presidential election, he has begun insisting that the game was rigged from the start. “The election is absolutely being rigged by the dishonest and distorted media pushing Crooked Hillary - but also at many polling places - SAD,” Trump tweeted on Sunday. “Of course there is large scale voter fraud happening on and before election day. Why do Republican leaders deny what is going on? So naive!” he tweeted Monday. None of this is true. The United States presidential election is more akin to 50 separate state elections (and the District of Columbia), organized by 50 separate sets of state officials, with a variety of different rules and processes. And on the ground level, these elections are run by thousands of different people of every possible political affiliation. The process of electing a president is too decentralized and fragmented for anyone to “rig” it at the ballot box in any systematic way. As for “voter fraud,” the evidence is clear. Setting aside the fact that the election hasn’t happened yet, the “in-person” fraud that Trump alludes to—where someone impersonates another voter to cast multiple ballots—happens so infrequently as to be essentially nonexistent. Out of 1 billion votes cast between 2000 and 2014, according to the most comprehensive investigation of voter fraud, there were just 31 instances of possible impersonation. Other forms of fraudulent voting are similarly rare. There is no basis for Trump’s claim. But that doesn’t mean it won’t stick. Already, according to the latest poll from Politico and Morning Consult, 41 percent of registered voters believe that the election could be stolen from the GOP presidential nominee. When respondents were broken down by party lines, 73 percent of Republicans said they feared a rigged election, compared with just 17 percent of Democrats. This outcome is a function of two facts. The first is partisanship—voters tend to agree with their chosen candidates. And that is tied to the second: the conduct and rhetoric of the Republican Party over the past decade. In the eight years since Barack Obama won the presidency, GOP lawmakers across the country have embarked on an aggressive campaign for new voter restrictions, all bolstered by false stories and insinuations of voter fraud. Minor problems—the occasional duplicate registration or misidentified voter that comes with running an election system—are turned into lurid stories of election year malfeasance, which then justify harsh new laws for voter identification and voter access. Justifying their sweeping and restrictive voting law, North Carolina Republicans pointed to an alleged 35,000 cases of fraudulent voting in the 2012 election, based on a report from the state’s board of elections. “These findings should put to rest ill-informed claims that problems don’t exist and help restore the integrity of our elections process,” wrote then–North Carolina House Speaker Thom Tillis in a statement. North Carolina Republicans weren’t alone in hyping claims of fraudulent voting. In Ohio and Florida, GOP lawmakers have done the same, all to justify new voting restrictions. What’s troubling is that Republicans seem to know that fraud is nearly nonexistent. When caught behind closed doors, or in a verbal slip, GOP lawmakers don’t cite fraud when defending voter ID or other restrictive measures; they cite raw partisan advantage. “Pro-Second Amendment? The Castle Doctrine, it’s done. First pro-life legislation—abortion facility regulations—in 22 years, done. Voter ID, which is gonna allow Governor Romney to win the state of Pennsylvania, done,” said one Pennsylvania Republican ahead of the 2012 presidential election, stating plainly that voter ID was a measure to help achieve a partisan outcome. You can tell a similar story in Wisconsin and Texas, where lawmakers have crafted voter identification regimes that primarily burden blacks and other people of color. And today, in the face of Trump’s attacks on the election system, Republican leaders are silent, so much so that Democratic leaders are pleading with figures like Paul Ryan and Mitch McConnell to speak out. “At some point, the good of the country must outweigh the instincts for political self-preservation,” write Nancy Pelosi and Harry Reid. This gets to the great irony of Trump’s claims. If there is voter fraud, it’s the fierce and long-running attack on the legitimacy of black voting. And it’s an attack that Trump, his surrogates, and his supporters have trafficked in throughout the campaign. On Sunday, Rudy Giuliani argued that people ought to monitor voting in predominantly black neighborhoods and cities. “There are a few places where they have been notorious for stealing votes,” he said on CNN’s State of the Union, “Pennsylvania, Chicago.” Trump himself likes to go to white suburbs in battleground states and warn darkly of what might happen elsewhere on Election Day. “So important that you get out and vote,” he said at a rally in Ambridge, Pennsylvania, near Pittsburgh. “So important that you watch other communities, because we don’t want this election stolen from us.” Ambridge is 78 percent white. You don’t need a decoder pin to crack the meaning of “other communities.” There is indeed a conspiracy to rig the 2016 election, and if it succeeds, it will only be in Donald Trump’s favor.